That Kev, aka Our Man In Felixstowe, has been laying low, shuffling around in exchanges. Try as you might, you can't read his poker face. Possibly his last lunch outing with our good selves was two years ago at the Flaming Fryer. Phone rings, contact is re-established, and he has a tip-off about a new place. Time to go to the 'Stowe. Opposite the Leisure Centre is the Undercliff Road block of businesses. Still going strong are The Conservatory and the Little Ice Cream Co.. Looks like curtains, sadly, for Joe Crowley's, unless that's a refurb on the go. Right on the end, past Domino's, is a shop which has been a coins and stamps centre, a car rental place, etc. 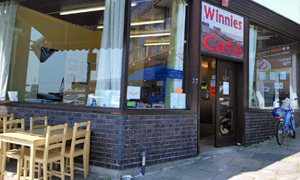 Now it's home to Winnies Cafe (don't spare the apostrophe). There's an old bespectacled fella sitting on the side: happy Monday, Kev! Our trio takes a table in the window -- not a bad view of the sea on this glorious day -- and tries to read the big blackboards. Special is chicken and cranberry. Please order at the counter, it says, but then a waitress takes pity on the party of three. Between us we go for the scrambled eggs on toast (Kev), a stilton and bacon bap (Andy) and a bacon & egg sarnie (me). White bread only: no matter. Like a slightly more upmarket version of the Family Cafe down the road, which is no bad thing. Food arrives, disappears, everyone's happy. Scattered around are some local flyers and the EADT and Sun, and there are some paintings for sale, much like the unfortunately now-closed Bonnet. Even a table or two outside if the wind's not too strong. We demand cake and coffee. I'll make a fresh pot, says the man behind the counter. Fine by us. Victoria or carrot cake? Strictly for reviewing purposes, we need to try a piece of each. Cake good. Coffee's fine though would have been better with some proper milk. Perfectly friendly, well placed: we'll see how they do. If it was a car -- Renault Master. If they were passing by -- Sophie Ellis-Bextor.